Rising above the holy city of Lhasa, the white walls and golden roofs of the Potala (BudalaGong) seem to grow out of the hill on which it stands. Now a museum, the palace is a labyrinth of rooms, interconnected with countless doors, corridors and stairways, galleries painted or draped with richly coloured silks, and filled with around 200,000 statues. The Potala served both as a monastery and government office. But above all, it was the residence of the Dalai Lamas, the god kings who ruled Tibet for more than 500 years, each one believed to be an incarnation of Avalokiteshwara, the Buddhist embodiment of compassion. The Dalai Lama is the head of the Yellow Hat sect of Tibetan Buddhism. A Mongolian phrase, Dalai Lama means ‘ocean of wisdom’. The 14th Dalai Lama was only 16 when Tibet was occupied by the Chinese in 1951, under whom he ruled in a limited capacity until 1959, after which he fled to India with 80,000 followers. According to popular Tibetan belief, the Potala named after the holy mount Potalaka, sacred home of Avalokiteshwara in South India, was raised supernaturally in the course of one night. Its history began in 641 AD when Songtsen Gampo, the 33rd Yarlung king of Tibet, built himself a palace on what was called Red Hill. This structure was later destroyed and rebuilt more than once. Construction of the current palace began during the reign of the great 5th Dalai Lama, Lobsang Gyatso (1617-1682), credited with reuniting Tibet. The 5th Dalai Lama is also remembered for having sent 2,800 monks to see the Chinese emperor in 1652. 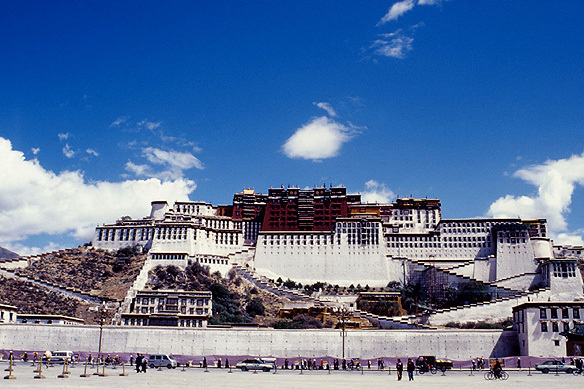 Building the Potala was an enormous undertaking involving many thousands of men. Huge amounts of stone and sand from behind Red Hill were used in the construction; the resulting pit was later turned into a lake, the Dragon King Pool. 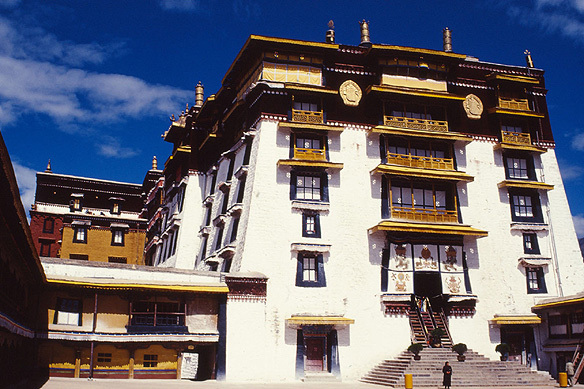 The 13th Dalai Lama expanded the edifice to its present scale. The huge walls surrounding the palace are fortified with watchtowers on the two southern corners. The 1st to 4th Dalai Lamas were only religious leaders. It was from the 5th Dalai Lama onwards that they became both religious and political leaders of Tibet. The 3rd Dalai Lama spent a considerable time preaching sermons in Mongolia where he eventually died. The title Dalai Lama was assigned during his time. The 4th Dalai Lama was in fact a Mongolian. Built between 1645 and 1653, the outer White Palace, so called because of its whitewashed walls, constituted the winter residential quarters of the Dalai Lama, government headquarters, seminary and printing house. Guarded with images of the Four Heavenly Kings, a broad corridor leads from the palace to Deyang Shar courtyard, where the Dalai Lamas used to watch operas. The printing press at Potala was, like all others in the country, under the control of the monks. Hand carved wooden blocks were impressed on paper made from the crushed bark of daphne; the printed sheets then wrapped in silk and kept in wooden covers. The Red Palace, built between 1690 and 1693, was the religious center of the complex. It contained the monks’ assembly hall, a multitude of chapels and shrines, libraries of Buddhist scriptures, and golden funerary stupas housing the embalmed corpses of some of the Dalai Lamas. The greatest of these stupas is that of the 5th Dalai Lama in a 16-pillar three-storied hall. Made of sandalwood and standing nearly 15 meters high, the stupa is coated with four tonnes of gold studded with around 10,000 precious stones including diamonds, sapphires and rubies. A finger from the Dalai Lama’s right hand along with holy thangkas are enshrined inside the stupa. The 13th Dalai Lama was regarded as great as the 5th Dalai Lama. His stupa, built after his death in 1933, is comparable with that of the Great Fifth’s, being 18 meters in height and coated with a tonne of gold foils. Murals in the hall recount important events in his life, including his visit to Emperor Guangxu. Apart from stupas, murals, and effigies, the palace contains a number of mandalas, the most prominent being the Kalachakra mandala built by the regent of the 5th Dalai Lama in 1680. With 734 images and 12 meters in circumference, the mandala is further surrounded by 162 effigies in the chapel, including that of Kalachakra, Manjushri, Sridevi, and Padmasambhava. Mandalas are believed to be the abode of meditating Buddhas, who are portrayed as two-headed tantric images representing the union of compassion and wisdom. Mandalas are also used for the Tibetan calendar and are a symbol of eternal life. The Lima Lakhang chapel has an interesting collection of over 2,000 small bronze statues of Buddha from Nepal, India and Tibet presented to the Dalai Lamas over the years. Also of significance is the chapel of the blue haired medicine Buddhas which are worshipped for speedy recoveries, and the Rigzin Lakhang, the tutor chapel, containing eight effigies of the Indian master Padmasambhava with various demonic faces. Tibetan art, sculpture and even architecture are rich in symbolism. Twelve rings around pillars denote the 12 paths to nirvana. Eight non-funeral stupas signify each step towards Sakyamuni’s enlightenment, the most key being compassion. During the early history of Buddhist art, idols did not exist. Stupas containing scriptures were used instead as representations of Buddha and worshipped. Dharma Cave and Saint’s Chapel are the only structures in the palace from the 7th Century. Dharma Cave is said to be the place where King Songtsen Gampo practiced Buddhism and meditated. Inside the cave, statues of Songtsen Gampo, Princess Wencheng, Princess Tritsun and his chief ministers are enshrined. In the Saint’s Chapel above Dharma Cave, Tsongkhapa, Padmasambhava, the 5th, 7th, 8th and 9th Dalai Lamas are enshrined and worshipped. Of special interest is a stone with the infant 12th Dalai Lama’s footprint and the statuette of Avalokiteshwara, considered to have been ‘naturally’ created along with three others, from a sandalwood tree; the other three are in India and Nepal. This entry was posted in Exploring our World, Tibet and tagged 13th Dalai Lama, 5th Dalai Lama, Avalokiteshwara, Dalai Lama, Dalai Lama's Flee to India, Dharma Cave, Kalachakra Mandala, Lhasa, Lima Lakhang Chapel, Potala Palace, Songtsen Gampo, Tantric Buddhism, Tibet, Tibetan Buddhism, Yarlung Kings, Yellow Hat Sect by Rama Arya. Bookmark the permalink.